It’s been a sunless, cloudy, gloomy day and I am most disappointed for I really wanted to share some pretties!! This is Mentality Shadow.The most apt description is from the maker.. 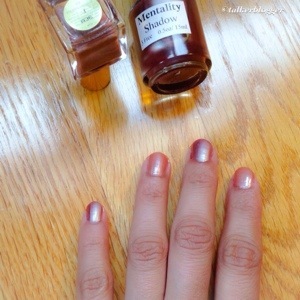 Shadow is a blackened rose metallic creme nail polish. I had never heard about this brand before but they have an ongoing promotion on Facebook and twitter till 4/20/2014 for a daily free holo polish giveaway.. And I was interested! 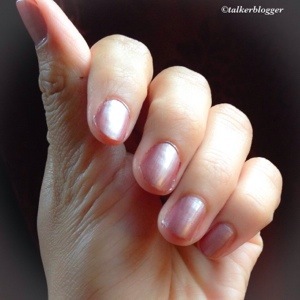 Yes, they are not dupes but the application and finish is similar. OVERALL I feel that the quality is very good and worth the price. My favorite part is that the company has free shipping all over USA , my packet came within 4 days and that’s pretty neat. Personally , I don’t think that the swatches on the website are accurate or do justice to the polishes, but surely they have something for everyone and the best is their attitude, depending on your preference they will recommend the best product for you. I love it when you get a great product at a great price and have the bonus of excellent experience. Do enter the free giveaway by following the twitter /Facebook page and look here for promotions…let me know what you all think .. 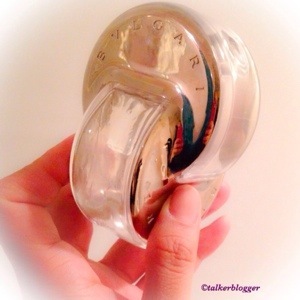 I just wanted to share my top 5 must have-can’t live without beauty products. If I was denied all makeup and just left with a choice of 5 things, these would be it .. 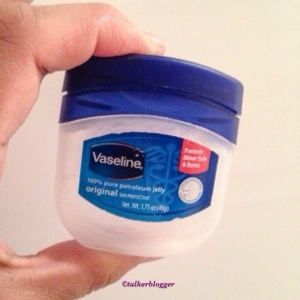 The Good’ol Vaseline: Nothing beats it for moisturizing hands, feet, face and chapped lips. Also the best makeup remover. I learnt this trick during my short time shooting for a bollywood movie. At the end of the day, we used a lot of baby oil ( Vaseline works equally good), rubbed circular over face and neck and then wiped with a tissue. All makeup gets pulled out from the pores. Then just a good water wash and you are all set ! I really believe in this because it’s a crazy idea to remove makeup with chemicals , defeats the whole “chemical free” skin purpose. Kajal or a Kohl EyeLiner: I love beautiful eye makeup, but with 2 kids and chasing them, who has the time? This is my makeup essential that defines the whole face. I have been wearing a black kohl pencil for years now .. And it’s super easy.. Just a line on tip of the eyelid and one starting from the tear line to the end .. And that’s a go! 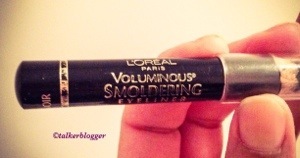 I have tried a few brands and this one from L’oreal is my favorite, costs $6 and lasts all day. Plus soft enough for easy application and smudge proof. 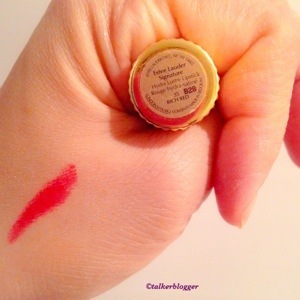 A Red Lipstick: My favorite one for a while has been the Estée Lauder Signature 35 Rich Red. It’s a true Red! Very very moist and great easy application. Can be used as a cheek highlighter as well. I have used his directly or with a brush for precision either way I love it. I change the color to a lighter shade by dabbing on my lips and rubbing Vaseline on top.. So it’s a win.